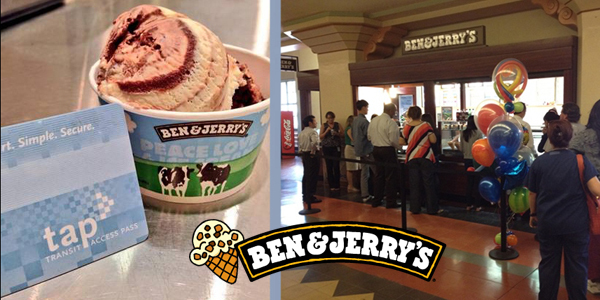 Make your way to Union Station Los Angeles and try Ben & Jerry's! Discover your personal euphoria with Ben & Jerry's super premium line-up of Fair Trade Ice Cream, Greek frozen yogurt, and Sorbet. Indulge in their famous chunky monkey ice cream with a waffle cone during your wait in Union Station. Enjoy TAP Card Tuesdays! Show your valid TAP card, Metro employee ID, or LA County employee ID to the cashier on any Tuesday and save 10% on all Scoops, Milkshakes, Smoothies, and Sundaes. Ben & Jerry’s is located in Union Station at 800 N. Alameda Street in Los Angeles. Take the Metro Gold, Red/Purple, or Silver Line to Union Station and walk towards the Union Station info booth. Plan your trip below. This discount is only valid on Tuesdays and cannot be combined with any other offers.